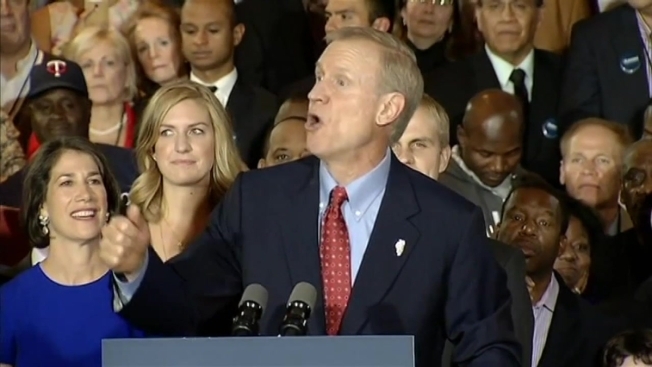 Governor-elect Bruce Rauner added some familiar faces to his transition committee. Speaking publically to the media for the first time since his Election Night win, Rauner on Thursday revealed the committee's full team, which includes former White House Chief of Staff Bill Daley, former Governor Jim Edgar, Rev. James Meeks, former Congressman Glenn Poshard, Congressman Aaron Schock and Pastor Corey Brooks. "I am committed to assembling a diverse and talented team to drive results for our state and bring back Illinois," Rauner said in a statement. "It is an honor to have such a talented group of individuals working with me to get our state working for the people again,” he said. NBC Chicago's Political Editor breaks down the governor's race, what's next for Bruce Rauner in Springfield, the bad night Democrats had, and what it all means for 2016. In all, 16 members are from the business community, including Caterpillar CEO Doug Oberhelman. Rauner earned 51 percent of the vote to Gov. Pat Quinn's 46 percent, prompting Quinn to concede on Wednesday. Libertarian candidate Chad Grimm took 3 percent of the vote. Quinn said he appointed his chief of staff, Ryan Croker, to act as a liaison to the incoming administration and pledged his support to work with them. The Rauner team released a statement after Quinn's announcement. Governor Quinn conceded to Bruce Rauner one day after vowing to wait until all the votes were counted. Both Quinn and Rauner have appointed transition teams for the next two months. Mary Ann Ahern reports. -Doug Oberhelman – CEO and Chairman, Caterpillar Inc.
-John Gates – Chairman and CEO, PortaeCo, LLC. -Eleni Bousis – Board Chair for the Greek American Rehabilitation and Care Centre, Entrepreneur of Frontida (CARE) Institution supporting and assisting women and families in need and Board Member for Leadership 100 and the Little City Foundation.